Justin and I both consider ourselves people who love to spend time in the kitchen cooking and baking form scratch. In a perfect world, we would both get off work with plenty of time to grocery shop and then Easton would take a fortuitously timed nap or quietly play by himself for 30-40 minutes so that we could make a homemade dinner every night. In reality, Easton usually decides around 5pm that he hates napping and playing and wants to be held or entertained leaving us about 5 minutes to get dinner ready. In the first few months of Easton's life frozen pizza was a lifesaver. I would stock up when they went on sale at Publix and when Easton would finally fall asleep Justin and I would rush to put one in the oven and say a prayer that he would stay sleeping long enough for us to enjoy it. Our recent favorite has been Freschetta's Brick Oven Pizzas because we love how they use quality ingredients and taste like they were made fresh. Now that Eason is a little older (and we are a little more adept at this parenting thing), I try to make some thing homemade to pair with our pizza on busy nights. 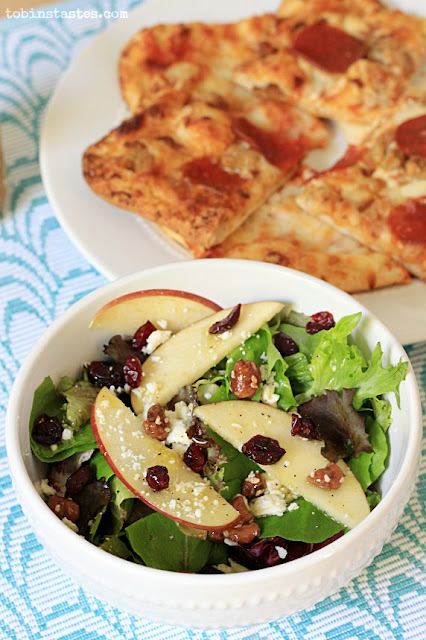 This Cran-Apple Salad with homemade Apple Cider Vinaigrette is an easy salad to throw together and it goes perfectly with pizza. Most of the salad ingredients are things I things I usually keep on hand- bag of salad mix, feta cheese, apples and dried cranberries. When I have them in the pantry, I add some pecans. If you want to make life even easier you can buy a bag of salad toppers with the dried cranberries and pecans already mixed together. I have vivid childhood memories of my mom making a fancy homemade vinaigrette for dinner parties. She use to store it in the fridge in this crystal dressing bottle with a little stopper. Every time I make homemade dressing, I wish I had something like this to store it in but since I have yet to purchase one I usually use a mason jar. 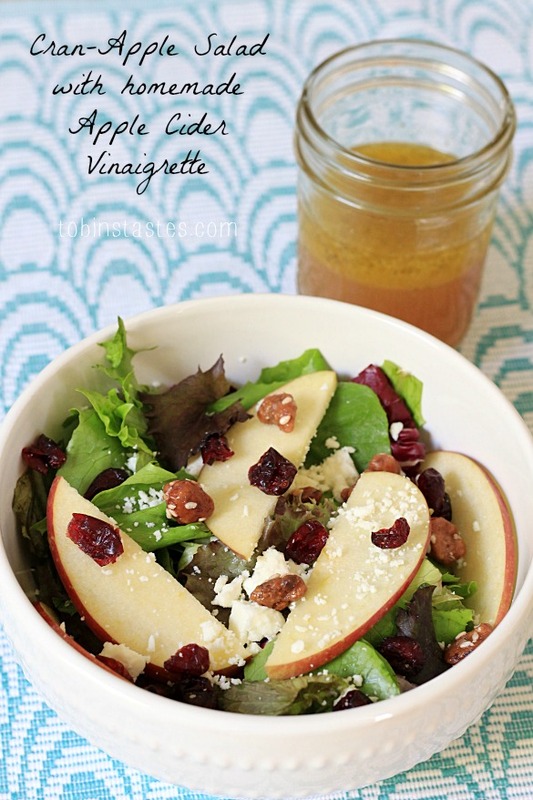 The vinaigrette can be made ahead of time (hello naptime!) and refrigerated for when you are ready to eat. I made it and stored it in the mason jar to cut down on dishes. 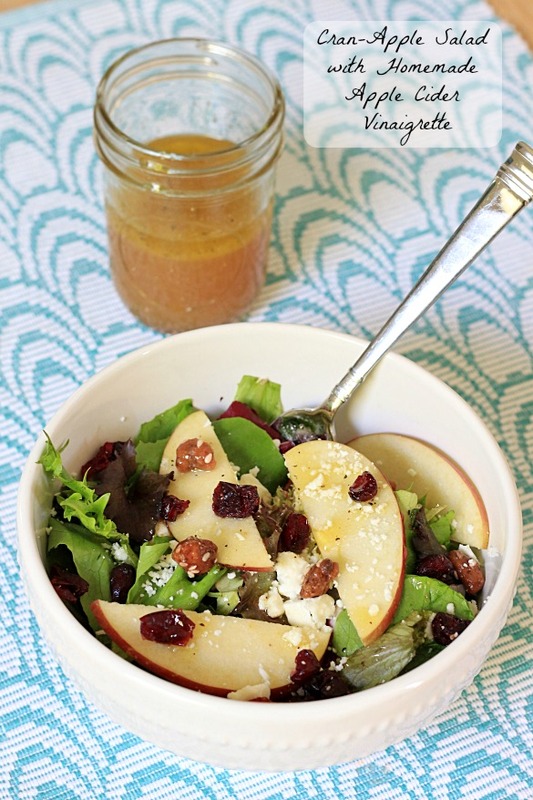 Mix together all the ingredients and drizzle with the vinaigrette. Serve immediately. Put all ingredients in a large mason jar. Shake to combine. Can be stored in the fridge until needed with lid tightly on. Just reshake to combine if it sits for awhile. 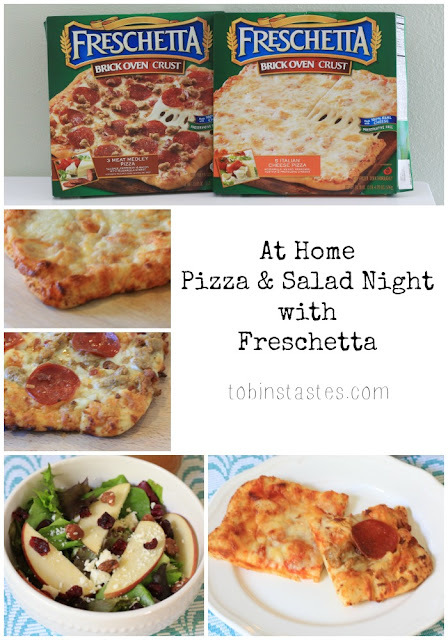 Right now is the perfect time to stock up on Freschetta Frozen Pizzas because they are on sale 2/$10 at Publix. I was hoping to try out the new Artisan Crust varieties as they have 3 whole grains baked into the crust but none of my local stores are carrying them yet so I grabbed a few of our favorite Brick Oven ones. What do you like to make on pizza night?